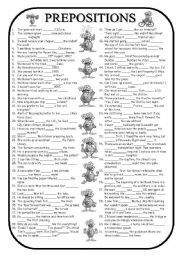 109 BLANKS to fill in with appropriate PREPOSITIONS to give your students a thorough practice. ANSWER KEY is also being given. Hope you find it useful. Have a nice day/evening.